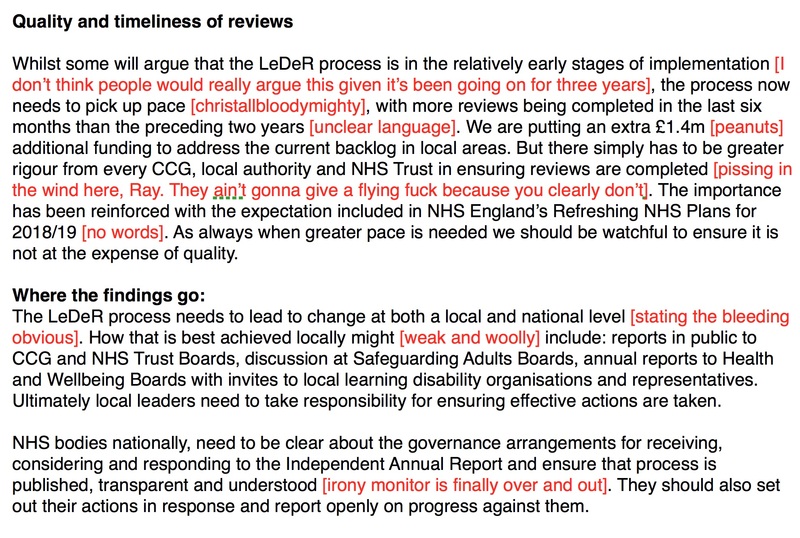 Woeful, woeful first response from Ray James, NHS England learning disability lead, to the #leder review. He states families ‘unparalleled insight should be the acid test of whether we are doing enough’. Okeydokes… A bit of insight for you Ray. Comments in red. This entry was posted in Jeremy Hunt, NHS England by sarasiobhan. Bookmark the permalink. 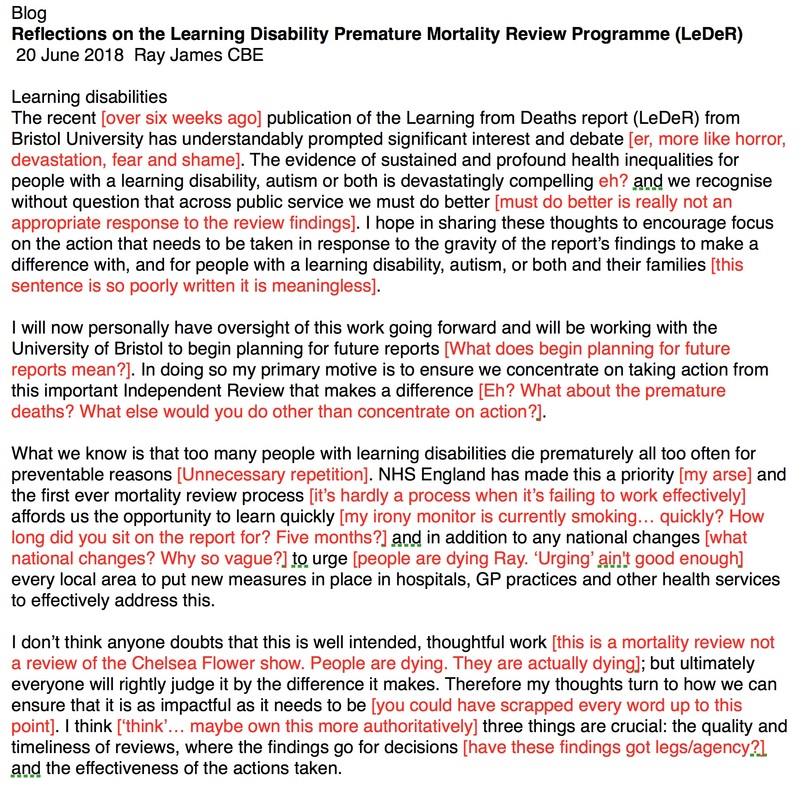 Ray James may be happy to wait until next year but people with learning disabilities and their families can’t afford to wait to find out who will be next in line for a preventable death. To state the wait is in place so that there is a focus on ‘how we ensure more people with a learning disability, autism or both lead longer healthier lives.’ is unacceptable. More people? So, not an expectation of every person? Are you admitting more lives will be cut short in the NHS and adult social care because they had to wait? So the plan is to continue with the lottery for life until there is a plan? You need to sack yourself then. It’s taken 70 years to get a response like yours. What is there to celebrate? Ray James, kick start the job you are being paid to do by ensuring every single person with a learning disability is treated as an equal citizen, with full justice at hand and the highest penalties for any authority who breaches the law. The plan is this: Offer and ensure the same right to life as you value and expect – first class healthcare, choices in housing and work, equal rights, human rights, in fact, full citizenship of the UK. People do not die of a learning disability or autism. Leading longer healthier lives, the duty of care and the duty to protect life was never negotiable. That is what is so shocking about LeDeR. It has been. It had to be known GP’s haven’t received thorough training when the long term hospitals started to close. It had to be known people’s annual health checks were below NHS expectations. It had to be known that people weren’t attending their hospital appointments and were not being provided with full access to health screening. It had to be known that hospital professionals have never been trained to manage expectations when a patient with a learning disability arrives at A&E. The state can’t graciously decide when it’s time to start ensuring people’s lives aren’t cut short. Ray James, you have your remit; people in youth and middle age are dying unnecessary and wholly preventable deaths because they are being grossly neglected in places where their families are told they are safe. When healthcare needs aren’t met people die early, a 19th century death. It’s an ongoing conveyor belt of deaths, let down by the state. You know the worst, get on with it. Your time is up. Wow. I have read this response a few times now and I am not sure that there is evidence that RJ has read the report or engaged with the findings. 3. Delays in care or treatment. 4. Gaps in service provision. Why are we not talking about: prioritising all forms of communication – with people with learning disabilities, with families, with health and social care workers – and the recording and sharing of relevant information in order to provide high quality care; rigorous training; effective management of processes; accountability at all levels, staffing ratios, the learning disability nursing crisis etc etc? 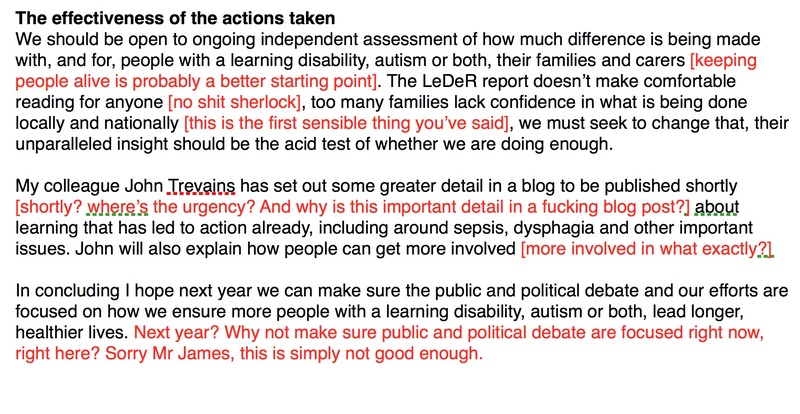 Like Mazars, the LeDeR report has sent shock waves through those who love and care for someone with a learning disability. It is all our worst fears, spelt out clearly in black and white. And there has been no response from the government (we don’t count the half-hearted and inaccurate response by the Minister for Care, Caroline Dinenage to Barbara Keeley MP’s urgent question). We know that our family members with learning disabilities face discrimination in the community – the LeDeR report confirms that this discrimination is institutionalised and is resulting in shorter lives due to poor quality care and a lack of political commitment to address this. Urgent action is required and this entirely content-free response from Ray James is frankly an insult. …where their learning disabled son/daughter is still a child and not yet requiring any involvement from the State – and or families, with adult sons and daughters who currently avoid State intervention by mum/dad ensuring that their safety is ensured and their health and social care needs are met – at home.. These families need to begin to learn about and engage in the action against the criminal state of Health and Social care for too many vulnerabe others – others who have learning disabilities and whose lives and happinesses are precariously in the slippery hands of State employees…..
…and then the other poor souls who have no one at all to protect them, from the same. I have tried to share LeDeR etc with some such families. Most do not want to know for allis OK at present – and alternative future is too scary a prospect to envisage. But, unless they come together with the many familes who are enduring the worst of all stress and risk – now they too – will face the same…sooner than they know. The same cliff face waiting for their beloved beautiful son and or daughter..is .getting ever steeper… and creeping ever closer. If I could turn the clock back knowing what I know now, I could have prevented some of what’s happening now – I’d have had some strategy rather than this. But I thought, similarly perhaps to families with children now, that they’re in crisis already, think there are fairly good services, and aren’t ready for what may come. The present’s maybe all they can handle, future too much to contemplate. But they’ve a right to know as all young people have some picture of the future. There are 2 laws in this country which should be abolished the Mental Capacity Act and the Mental Health Act. I know the MHA is used for political prison reasons, up to 13 days of abuse then chucked onto streets due to independent tribunal on day 14 of detention. The state has zero right to say when its citizens will be allowed fundamental human rights like to live and not to be tortured. Those with Learning disabilities, who on the whole and judging from people I’ve known, are some of the most beautiful souls on this planet face a life of discrimination and abuse. Those with mental health problems get the same. Unfortunately whistleblowers for both these groups are excluded isolated and effectively silenced. Why are people not taking to the streets at the killings? Those Acts are abused – they tempt workers into not listening to emotional needs but judging and needing to keep people quiet and ‘settled’ by any means – using Acts to justify what they prefer – the Acts often mean actions that should take minutes to help a person who needs help now, can take days or months to do as workers instead go to meetings and paperwork. The best safeguards are family, where they’re good. We can’t argue with nature – families will protect their own, and others will protect themselves – some in between or better (luck). Only where professionals and family both listen is living possible. I think many workers prefer not to communicate, so illness tries to communicate. I’ve got workers who are still learning to listen but misjudge and it’s like I’m teaching babies to do a responsible job. I spent years honing my communication with my son – and the most exhausting thing is training others. I so agree about beautiful people with learning disabilities, the most selfless, just wanting love in the worst circumstances. Money is the root of all evil, and we’re not much different to the African corruption you mention. I remember a documentary on an African country about children kidnapped and sold, and a rescue team returned a boy to his father – as the father saw his son get out of the minibus and walk towards him, he fell on the ground kissing the dirt as his boy walked towards him – the pain on his face – I felt it. Why create prisons for each other? Discrimination in papers is too often racism or sexism – I’m sick of MeToo – this is the worst as the people can’t tell us. Sorry – that was a reply to dragonire – yes, why aren’t we doing more? everything I want to say is here…in red pen. In commenting on his Panel’s report on deaths at Gosport War Memorial Hospital, Bishop James Jones likened it to the title of his report on Hillsborough – ‘“The patronising disposition of unaccountable power”. His panel concluded that the lives of more than 450 people were shortened as a result of an, “Institutionalised regime” of prescribing and administering opioids without medical justification. Gosport War Memorial Hospital in now managed – you guessed it – by Sloven, which issued a public statement containing the usual duck-billed platitudes: https://www.southernhealth.nhs.uk/news/gosport-independent-panel-report-20-june/. There is a link there to the Panel’s full report too. So we have the Bristol Heart Scandal, The Mid Staffs Inquiry, the Mazars Review and now the Gosport report – all with similar patterns of behaviour by NHS clinicians and executives. In his report on the high mortality rate of babies undergoing heart surgery at Bristol Royal Infirmary, Sir Ian Kennedy referred to, “‘An old boy’s culture’ among doctors, a lax approach to safety, secrecy about doctors’ performance and a lack of monitoring by management and an, “Arrogance born of indifference”. Funny, isn’t it, that so many of the victims of NHS “underfunding” just happen to be those whom certain doctors consider to be “not worth saving” because they are old or disabled. Anne – I saw this too. My reaction was that an allegedly under-funded NHS requires doctors to save money by prescribing less medication, not more. Maybe it is time to talk about institutionalised murder? The “response” is just going to consist of an endless conveyor belt of expensive reports, reviews, mission statements about “going forward”, “working with colleagues on discussions about future policies”……and so on and on…..
A new Health Secretary. Is this a good moment to apply pressure for a response to the Leder report?